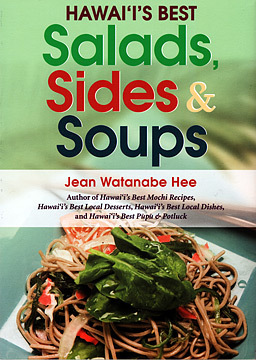 Jean Watanabe Hee marches on with her collection of "Hawaii's Best ..." cookbooks -- her newest celebrates the "S" food categories, as in "Hawaii's Best Salads, Sides & Soups" (Mutual Publishing, $13.95). Hee's previous cookbooks covered mochi, main dishes, desserts and pupus, so this one pretty much fills out the menu. As usual, it's a no-nonsense collection of local favorites that cuts across ethnic lines. In the soup category alone you'll find Filipino Chicken Papaya Soup, Japanese Ozoni, Chinese Imitation Bird's Nest Soup, Korean Kim Chee Soup -- as well as good old Minestrone. The book is widely available in bookstores, or order via www.mutualpublishing.com. Call 732-1709 or e-mail mutual@mutualpublishing.com. 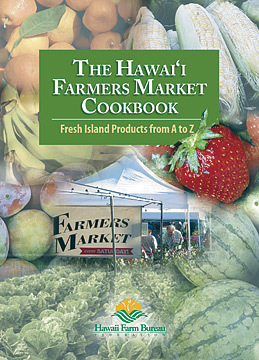 The Hawaii Farm Bureau introduces its new "Hawai'i Farmers' Market Cookbook" (Watermark, $15) Saturday at the third-anniversary celebration of the open market at Kapiolani Community College. The cookbook, published with the help of the Honolulu chapter of Le Dames d' Escoffier, incorporates recipes from local farmers for grown-in-Hawaii produce, true to the theme of the markets. It also includes profiles of farmers from all islands. The event at KCC's Saturday Farmers' Market will include a cooking demonstration by chef Roy Yamaguchi and Brooks Takenaka of the United Fishing Agency. They'll be making a monchong dish, with 200 free samples. Market hours are 7:30 a.m. to 11 a.m. The cookbook will also be sold at Farm Bureau markets in Kailua (5 to 7:30 p.m. Thursdays) and Mililani (8 to 11 a.m. Sundays). Or visit www.hfbf.org or call 848-2074.